Catzowey! Itza da Halloween week, when it's purrfecatically normal for purrsons to dress strange and not normal, and fur some of us to stare strangely - datsa normal on da Halloween week. Without a doubtacat, this guy izza seeing da world from behind his green PURRmeable contact lenses that don't fit him too good - he needs a new Optomicatrist. My eyes izza nachural green - yep uh huh fur shure, theyza da real thing. Meowza WOWza! Youza never ever gonna see a fine feline decked out as a half-peeled Banana! Whatsa this guy thinking? Birds of da feathers flocks togeathers I guess, but I never seen da smiling Rooster this big in EyeTailYa! Itza jungle of animewls at Pet Pride's purrade and this Skunk was creeping along the path. Good news and mews: he didn't do da squirty furty thing! Weeza was safe in his purresence and I wazza UP wind just in case!! Being out and about wazza dangeroso and I came upon thizza doggone Dragon trying to flatten da dog. I came to da dog's rescue, justza in purrfecto time and did a giganticat hiss fit and da Dragon fainted - saving da dog from having a Cat-ostrophic day! Big Devils and Little Devils everywhere atza this event but at least theyza happy Devils and wearing good eye purrteckshun , so the YOU-VEE stuff don'tza do damage. Itza always impurrtant to keep yur shades on whenza youza out in da sun so remember datza, yep youza remember dat! Nowza youza sees my costume and into yur eyes disguise - not a chance these canines knew theyza wazza being followed by da EyeTailYun Papurrazzi! 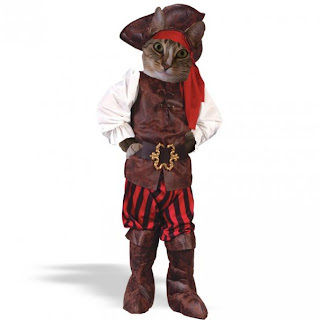 Youza have a doggone meowvalous Halloween and be shure of no Twicks and just gets or gives abundacat Catzowey Tweets (fill da Tweets goody bag with Euros, Dollars, Catnip, more Euros, Gifty Certificiates fur Meowsage, more Euros, or furesh sashimi rolls)! Youza got da idea of making da nice Tweets bag! Catzowey! Me and myself izza meeting and greeting da Great Gourd and I weecently went to welcome the meowmungus orangie himself. Dressing fur da OKshun (wearing my DeeZiner puka pumpkin necklace) was my intenshun to makes him feel right atza home here at my home. Here we izza, shakin da paws. Hmmm, heeza not travelling solo, looks like he brought hizza wife on VaKayShun, but sheeza looking kinda pale! Maybe da trip from da field to da City wazza rough and twaffic congeshun wazza bumpy. "Nice to meetcha both" I said, as I reminded my guests that my EyeTailYun casa izza always open to all - itza hospurrtaility fur shure and weeza welcome all shapes and sizes.....hmmm, sheeza still looking pale and not communiCATing! Duz youza think I could be da PURRogate father of thiza pumpkin if me and myself sits and incucatibates it? Hey in this technocat world, who knows what create-acative invenshun I could hatch! Purrhaps striped pumpkies. But I do know, yep uh huh, I really duz know, or I did purrEYEor to my falling into my bed and passing out, dat da Great Gourds are mighty meowster seasonally special and colorful too and really nice to have in da house. Nowza Meowza, I'ma snoozing and cruising thru abundacatnaps di giorno ... cuz entertaining da Great Gourd and his festive fall self, izza da increducatulous experience and da cat's meow fur shure. Can ya see Christopher on da Santa Maria, or izza it da Nina, hmmm maybe itza da Pinta? Heeza waving to me cuz his EyeTailYun self sees that me and myself izza waving to him as he arrives safely on my shores of San Franfuncisco. It's fur shure I would have turned green and my stripes would have collapsed on da oshun adventure and Catzowey I wazn't gonna be wanting any Pesto Meowgarita Pizza on this cruise! Ever since I wazza inky dinky I indulges in da EyeTailYun food on Columbus Day. I enjoys a giganticat but good glass of Pinot Grigiocat and then I kicks back to be a relaxacat purrusing da latest stack of Catalogues cuz I got no mail arriving on Columbus Day. WOWza MEOWza even da postie people takes off this day to honor Signore Christopher. Andza my purr masheen revs up when I gets my favorito Pesto Nip Meowgarita Pizza - all in honor of youza knowza whoza. Basta pasta! Life is catzowey! We gotza so so so many famous EyeTailYuns and here's one of da favoritos of mine: yep uh huh, it's my furiend Frank! But most of youza know him as St. Fwancis. He and me confurred last Sunday on St. Fwancis Day at da CAThedral - his powerful paws hugged me all cuz he showed up to bless me (how come he was muttering someting like "Oh Guido you needza da double blessing fur shure today"? Heeza kinda quiet but he's got da mighty meowvalous magical touch! So I wishes you a nonCATastrophic Columbus Day! And if youza gets a meowment, have a little PURRshutto or a creamy Catnolli in honor of Chris sailing over da oshuns blue! Itza Fall and me and myself (yep uh huh, my organicat self) has falled into da famous Fall foliage and landed in da Farmers Meowkart, cuz itza filled to the maxEEmum with sensayshunal vegies and fruities. So come on along and I'ma not singing a song, but let me andza myself take youza on a pawsatively great tour of what's hitting da fruits di giorno runway and rolling towards our Autumn Vegie Tables.... Here we goes.. Early Girls get da worm - oops! I thinksa it's early birds got da worm but I got da word on Early Girls tomatoes and theyza bella beautiful and my EyeTailYun eyes are gazing at da Early Girls. They'za making my whiskers wiggle fur shure! MEOWza WOWza! Weeza arrived in da land of PepperOhCheeKnee - yikes itza hot red pepper land and these fruits of my home land are atza high tide this time of da year. The sweet red peppah will make yur whiskers wiggle fur shure but don't let it getza hold of ya! Youza gotta take control of yur PepperOhCheeKnee at all time! Basta Pasta and OH puhleezse boyz ... whatsa yur mommas going to think of yur Pawty Platter? Youza gotza control yurselves when youza sees da Celebricat tasting da Anju Pears! Looks like deeza guys hazza purrobably rolled in da pears and smoked da sweet seasonal fruits, cuz they'za mismeowhavin' and looking super silly too! Itza just a Pawty Platter! Cows frum CalEyeFurKneeYah izza happy cows! But Catzowey, whatza dis happy cow thinking bout? No blind cow dates fur this EyeTailYun kitty! So nowza you got da grocery list of whatza FUResh in da Farmers Meowkart waiting fur youza to show up with yur cloth bag - undoubtacatically that makes youza an OhFishYul envirocat! And without any further purrondering, theeza veggies and fruities wanna get ta know you better, so go and pick them up and getza them to yur table. You'za gonna be purrked up and ecstaticat you ventured to da Fall Vegietayshun! Wishing you a non-Catastrophic furesh Fall week!